The tax is imposed upon the sale at retail of tangible personal property and the furnishing of certain services in the County, and use tax only for the privilege of using or consuming in the County any construction materials purchased at retail, and for the privilege of storing, using or consuming any motor or other vehicles, purchased at retail in which registration is required all in accordance with the provisions of article 2 of title 29, C.R.S. Please be advised that Sales Tax in El Paso County will increase to the new rate of 1.23% as of January 1, 2013. Resolution No. 12-309 authorized a ballot question to increase the El Paso County Sales tax rate by twenty-three one hundreths of one cent ($.0023) for the elections held on November 6, 2012 and was approved by the voters. The sales tax increase has a sunset date of January 1, 2021 (8 years). The .23% is to be used for Public Safety Critical Needs as explained in Resolution No. 12-309. The imposition of the tax on the sale at retail of tangible personal property and the furnishing of certain services subject to this tax are in accordance with schedules set forth in the rules and regulations of the Colorado Department of Revenue, and in accordance with any regulations which may be enacted by separate resolution of the Board of County Commissioners. The gross receipts from sales include delivery charges, when such charges are subject to the sales and use tax as defined by the State of Colorado imposed by Article 26-102 of Title 39, CRS, regardless of the place to which delivery is made. Exempt from County sales taxation are all of the tangible personal property and services which are exempt under Section 39-26-114, CRS, expressly including the exemption for sales of food, sales and purchases of electricity, coal, wood, gas (including natural, manufactured, and liquefied petroleum gas), fuel oil or coke sold to occupants of residences, and sales and purchases of machinery or machine tools, as specified in Section 39-26-114 (11), CRS. The value of construction and building materials on which a use tax has previously been collected by the County is exempt from the County sales tax if the materials are delivered by the retailer or his agent to a site within the limits of the County. All retail sales are consummated at the place of business of the retailer unless the tangible personal property sold is delivered by the retailer or his agent to a destination outside the limits of the County or to a common carrier for delivery to a destination outside the limits of the County If a retailer has no permanent place of business in the County, or has more than one place of business, the place or places at which the retail sales are consummated shall be determined by the provisions defined by Article 26-102 of Title 39, CRS, and by the rules and regulations promulgated by the Department of Revenue of the State of Colorado. No separate County sales tax license shall be required. Any person engaging in the business of selling tangible personal property at retail or furnishing certain services as herein specified shall annually obtain and hold a state license. Note: In 2010 the Vendor Fee has been suspended (0.0%). The collection, administration and enforcement of the sales tax imposed by this Resolution will be performed by the Executive Director of the Department of Revenue of the State of Colorado in the same manner as the collection, administration and enforcement of the Colorado state sales tax. The term “construction and building materials” means any tangible personal property which is stored, used or consumed in the County, and which is intended to become part of, attached to, or a component of any building, structure, road or appurtenance in the County. For information on local sales/use tax rates, see the publication Sales/Use Tax Rates (DR 1002). This DOR publication is updated each January and July. View sales tax rates. Click Colorado Tax Rate Lookup. You will be prompted to register as a new user. Once registered, you will receive an email with a link that will take you to the login page. Once logged in, you can enter the address you wish to look up. El Paso County does not have a general Use Tax. Use Tax for El Paso County is only collected on construction and building materials as defined below and Motor Vehicles. Definition – The term “construction and building materials” means any tangible personal property which is stored, used or consumed in the County, and which is intended to become part of, attached to, or a component of any building, structure, road or appurtenance in the County. Construction and Building Materials Use Tax Collection. The collection of the use tax for construction and building materials will be administered at the direction of the Board of County Commissioners. The Use Tax may be paid by estimate through the payment of the tax at the time permits are issued for building and construction. As an alternative to the estimate procedure provided above, payment of this use tax may be made by the filing by any applicant for a building permit of an affidavit stating that the applicant intends to purchase all building and construction materials necessary for the project described in the building permit application from a licensed retailer licensed within the County. Every building permit applicant who utilizes the alternative procedure provided above shall maintain and preserve detailed purchase and receipt records which shall be subject to inspection and audit by employees of the Board of County Commissioners, and any unpaid taxes due shall be subject to collection. The collection and administration of the use tax imposed by this Resolution shall be performed at the direction of the Board of County Commissioners in substantially the same manner as the collection, administration and enforcement of the Sales and Use Tax of the State of Colorado. Collection Prior to April 1st, 2009. When the voters of El Paso County first approved the 1% Sales and Use Tax the Board of County Commissioners enter into an Intergovernmental Agreements (IGA) with the City of Colorado Springs to administer and Collect Use Tax on the behalf of El Paso County. The City of Colorado Springs will continue to collect use tax on all permits issued before April 1st 2009. When the permit applicant believes a project is exempt from Sales and Use Tax, the applicant must submit a Colorado Certificate of Exemption and a completed Use Tax Exemption Request Form to El Paso County for approval prior to issuance of the building permit. 1.) 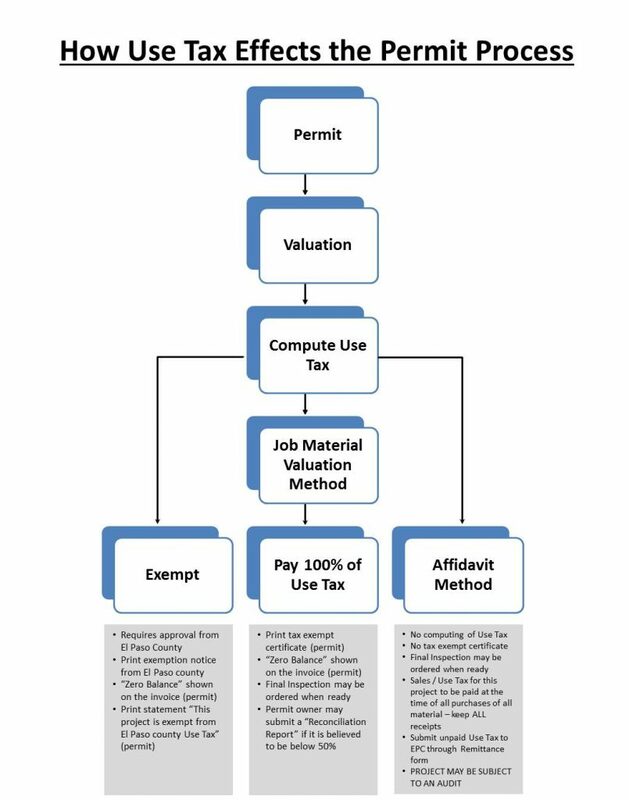 A permit applicant who selects to pay Use Tax by the job material valuation method can choose to submit 100% of the estimated Use Tax with the Regional Building Department when the permit is issued. 40% of the total construction cost is the estimated value of materials used in determining Use Tax owed. The permit receipt shall serve as the Exemption Certificate for use when purchasing building and construction materials. Note: The permit owner is responsible for insuring subcontractors receive a copy of the permit receipt for use when purchasing building and construction materials. When the permit owner believes the material cost for the project is less than the 40% estimated cost using the job material valuation method, the permit owner may submit a Reconciliation Report containing a list of all receipts and contract amounts associated with the project. The Reconciliation Report must be submitted within (180) calendar days of Certificate of Occupancy or final inspection which ever occurs later. El Paso County will provide a written decision within (30) calendar days whether a refund will or will not be issued. During this (30) day period the County may request from the permit owner or subcontractors some or all of the receipts listed on the Reconciliation Report. 2.) The permit applicant who selects the affidavit method shall sign the affidavit stating that regardless from where construction and building materials are purchased, it is agreed and understood that all applicable County Sales and Use Taxes will be paid by the permit applicant; the applicant shall maintain records demonstrating payment of the applicable Sales and Use Taxes; any construction and building purchased in which El Paso County Sales Tax was not paid is subject to Use Tax which shall be submitted using a separate Consumer Use Tax Remittance form for each permit; and they further agree and understand that they may be subject to an audit of these records. PLEASE NOTE: BEGINNING JANUARY 1, 2011, THE ACTUAL COST METHOD (AUDIT METHOD) WILL NO LONGER BE OFFERED BY EL PASO COUNTY. ALL PERMIT HOLDERS WHO HAVE CHOSEN TO USE THIS METHOD PRIOR TO 1/1/2011 ARE STILL RESPONSIBLE FOR PAYMENTS AS EXPLAINED BELOW. An administrative fee will be assessed on each permit issued for all construction related work in El Paso County to recover the administrative costs of collection. The following table is a condensed list of the administrative fee schedule used by the Regional Building Department. Complete surcharge schedule document here. All related construction records are subject to audit by the County following project completion. Such audit is designed to determine the actual taxable cost of the project and may be conducted any time within 18 months after the Certificate of Occupancy or final inspection, whichever occurs later. The audit will reconcile the Use Tax deposit paid against the actual tax due on the materials. It is important that you keep complete and accurate records of each project. A copy of the contract including change orders, all invoices, receipts and cost reports pertaining to the construction project shall be kept for at least (3) years after the certificate of occupancy or final inspection, whichever occurs later. If a formal audit by the County reveals an underpayment of the Use Tax, the remainder of the unpaid Use Tax, along with any interest and penalties will be assessed to the permit applicant. A complete audit is performed by the County on all refund requests initiated by the contractor. The interest and penalty interest rate for underpayment of the due and owing Use Tax (“Underpayment”) regardless of the method of payment chosen by the customer will pay to the County the amount of the underpayment shall be the same as allowed under Section 39-26-207, C.R.S., 2008, as amended. The amount of interest shall accrue from the date due, which is the date Certificate of Occupancy is issued or final inspection, whichever occurs later, and shall continue to accrue until paid. Upon written notification by the County of the amount of the underpayment, the customer may immediately pay the amount of the underpayment to stop interest from accruing while an appeal is undertaken. If you wish to review the Agreement in its entirety, please follow the link below.